For those of you who are frequent visitors of WestToast, you'll remember that at around this time last year, Josh had the privilege to Indulge at the Jupiter. Well, it's my turn this year! INDULGE @ THE JUPITER, Portland’s flagship culinary event, invites guests to indulge once again in all the senses: savor, sip and nibble on the Eastside’s finest foods. The third annual neighborhood festival of culinary arts benefiting p:ear is coming: Thursday, September 22, 2011 from 5:30 to 9 PM. 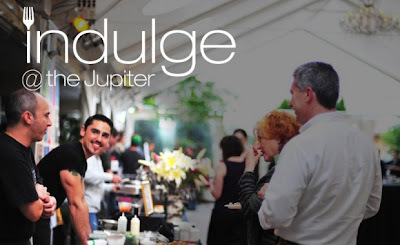 The premier edible event stars chef-owned restaurants, boutique wines and spirits, and the best tasty treats from local restaurants, breweries, and distilleries – all together under the Jupiter’s DreamTENT. Mingle with fellow foodies and browse a bevy of bites. Regular admission is $45, and early birds purchasing tickets before September 9th pay $40. Limited tickets available at www.indulgeatthejupiter.eventbrite.com. Guests enjoy the best of restaurant and bakery fare, as well as signature cocktails crafted on-site and drinks from local distilleries and breweries inside the Jupiter’s very own guest rooms. The proceeds from Indulge benefit p:ear programs helping to build positive relationships with homeless and transitional youth, ages 15 to 24, through education, art and recreation to affirm personal worth and create more meaningful and healthier lives. Each year these programs serve more than 550 homeless and transitional young people. Yes, you read that correctly. Not only do you get to eat and drink some of the best food and beverages Portland has to offer until you feel like you're going to explode, but it's all for a great cause. Oh, and there's going to be a Food Cart Land! Chomping at the bit to learn more? Check out Indulge's website and buy yourself some tickets. See you there!